New England's only E-Bike and Electric Bike Conversion Kit Super Store, with Conversion Kit brands like BionX, plus Electric Bikes from Stromer, Prodeco, Pedego, Currie, EG Bikes and many others. 75-100 Electric Bikes on Display - Visit Today for a Free Test Ride! In 2006 while owners Paul & Cathy were shopping for a pair of electric powered bicycles, we discovered no E-Bike retailer existed anywhere in the New England region. 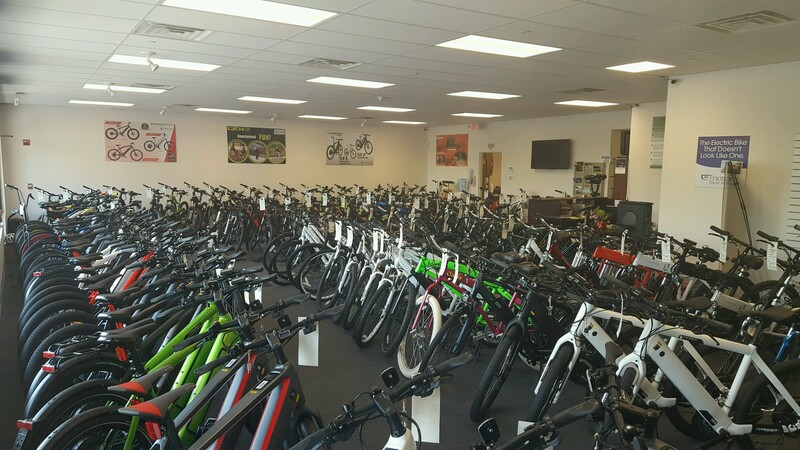 We took this opportunity to create a retail establishment that would offer a great selection of the best quality name brands of Electric Bikes and Electric Bike Conversion Kits. Now in our 10th year of business we have expanded our offerings to include most of the top brands in the industry today and additional parts and accessories to suit our valued customer's needs. Our custom builds complement the production models we sell and our wide selection makes a visit to our store the best decision a customer can make. If an Electric Bike is in your future, plan a visit today. We welcome a call if you have any questions about our products or services. Some of the brands we carry: Stromer, Haibike, IZIP, Pedego, ProdecoTech, GoCycle, Easy Motion, BionX, Falco, Ohm, Raleigh, e-Joe, Polaris, EG, eFlow and Juiced Riders. With 75-100 Electric Bikes on display every day, you cannot find a better selection of ebikes anywhere in New England. Electric Bikes of New England has built a great reputation and we have thousands of satisfied customers enjoying their Electric Bikes all over the country. Our Free Shipping and 30 Day Trial Ride Return Policy give customers the confidence they are looking for when deciding to make such an important purchase. Every customer needs an E-bike that fits their personal riding style. Electric Bikes of New England has been helping customers since the Electric Bike market started to grow in the United States. Please trust us to help find the perfect electric bike for you. Our mission is to help customers enjoy their riding experience more than they ever did before.